While Wangta Sagrisow (name changed) talked wistfully about how he had missed a tiger, he had a whole repertoire of stories about the forests and their animals that kept me gripped. So we continued to chat, although my questionnaire interview that aimed to understand the hunting patterns of different tribes in Arunachal Pradesh was long done. Now, as a 68-year-old man, he spends a substantial amount of time looking out of the balcony and into the happenings of his town. Wangta was once a hunter, who only stopped hunting because of the vagaries of age. We lost no time as he excitedly flipped through my field guides and animal photographs, rehashing memories and contexts about hunting. His gripping narrative was complemented by quick dashes into the kitchen, from where he emerged with a new artefact or two to illustrate his stories in the flesh. He showed me a piece of porcupine stomach which is believed to cure stomach ailments. On another such dash he couldn’t find a piece of bear gall bladder, believed to treat dysentery and tuberculosis. In this case it was given away to a sick family member — usually it would have made its way to the market for the wildlife trade. Wangta and older hunters grew up to a different kind of relationship with animals, especially with respect to trade. He doesn’t remember such a rampant bear gall bladder trade as exists today, but he once traded a sambar stag horn for a piece of prized Assam silk. However, another middle-aged hunter described in detail his observations of the rarely seen but highly traded scaly anteater, also known as the pangolin. Based on his detailed descriptions, the forests around Pakke Tiger Reserve are likely to be home to the Chinese pangolin as well as the Indian pangolin. Although the Indian pangolin would be a new mammal species recorded in the list of the tiger reserve, we know as little about its life as the threats it faces. After he found out that the trader from Assam sold each pangolin scale for Rs20 (on an average an adult pangolin has 900-1,000 scales), he ruefully told me that he sold the entire skin for just Rs400. It seemed spending time doing interviews was far too trivial compared with the prospect of indulging in wildlife trade. 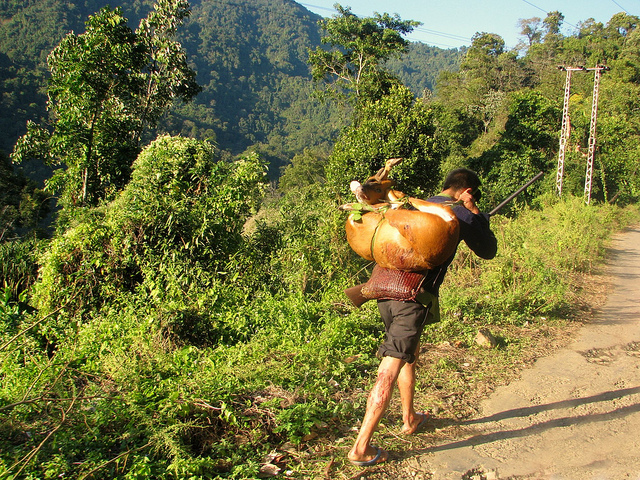 Hunters and people in the village would often approach us with business propositions related to medicinal plant trade or placing orders for the most wanted species. After being interviewed, or even halfway through a few interviews, a few left mildly annoyed and disappointed. Some things have remained constant — in part. Across time and space, there has been a marked dietary preference for barking deer meat. Then, they were killed and shared with relatives, but are now sold in the market for a modest amount of Rs150 per kg. While Wangta had killed only 25 barking deer in his lifetime, data from my study shows that other hunters were far more prolific. For example, the barking deer toll per hunter went up to as much as 100. When the war with China broke out in 1962, Wangta was only 18 years old. He remembers that then one kg of potatoes was just Rs1.30. The potatoes he grew were supplied to all government officers around. This helped him raise money for a shop he planned to open — the first in the village. Today, government officers stationed in these areas are one of the major consumers of the wild meat from ever-dwindling forests, while potatoes and other groceries come from many places. From these same forests, some species such as marbled cats, clouded leopards and leopard cats were not hunted before. They were considered to be closely related to the revered tiger, as tigers and humans are believed to have shared ancestry in the folklore of Wangta’s tribe. The religious ceremony to atone for killing a tiger is elaborate — hunters who have killed a tiger have to live on the roof of their house till the shaman allows them to re-enter. In death, this is still remembered. The approach to a tomb-stone has more steps built if a person has murdered a human being or killed a tiger, to make it difficult for the victims’ spirits to climb to the tomb when they seek retribution. Although Wangta had missed killing a tiger, others were willing to endure these rituals, especially if the animal had targeted their livestock. He had killed six marbled cats, some of which came for his chickens, but others just for sport — he had not consumed the meat. The subtlety of hunting for cultural reasons, meat, recreation, retaliation and not hunting is less apparent now. As one hunter observed: “You kill and eat whatever you get unless there is a market for it.” But the future stills holds many uncertainties. Before leaving, I decided to spend some time and look out from the balcony with Wangta. He pointed to a man working in the field — his son was the only child who had survived from three marriages and 14 kids. In retrospect, he believed that he lost so many children as retribution for hunting too much. His son, he explained, was now a Christian and did not know much about taboos or hunting. He will probably not be able to hunt a tiger in his lifetime as well; but for more than one reason — there might be none left.